2014 Show-Me Prize winner Hannah Scott. The State Historical Society of Missouri’s Show-Me Prize encourages National History Day in Missouri students to investigate a key development in Missouri history or explore how a Missourian contributed to a significant national or international event. Students chosen for the prize receive $50, learn more about their state, and have a chance to see their work included in Missouri’s bicentennial observances. The prize was created in 2014 to promote engagement with Missouri history among National History Day participants and to raise awareness of the upcoming 200th anniversary of Missouri joining the Union on August 10, 1821. 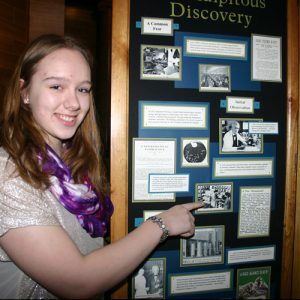 Each year, the State Historical Society of Missouri issues up to five prizes of $50 each to students presenting individual entries on Missouri history topics in the senior division of the state competition.